Gertrude Bell visits the bazaar. It was in Brusa that we went out to purchase some “stuffs for dress”—not that we contemplated making for ourselves ten robes each to the value of a thousand golden pieces, but that we had heard rumors of certain of the Brusa silks which were suited to less extravagant requirements. It was a hot, steaming afternoon; we hired diminutive donkeys and rode down Brusa streets and under the many domes of the bazaar. The quick, short steps of the donkeys clicked over the cobblestones; we looked around us as they went at the rows and rows of shop counters, the high vaults which arched away to right- and leftward, the courtyards open to the sky, set around with shops, grown over with vines, gleaming with sunshine at the end of some dark, narrow passage, the people standing about in leisurely attitudes, and the donkeys, which walked diligently up and down, carrying now a veiled woman sitting astride on her padded saddle, now a turbaned Turk, and now a bale of merchandise. At length we came to the street of the silk merchants and dismounted before the shop of an old Turk who was sitting cross-legged within. He rose and with many polite salaams begged us to enter, and set chairs for us around the low enameled table. We might have been paying a morning call: we talked—those of us who could speak Turkish—of Saadi and the musical glasses, we sipped our cups of delicious coffee, we puffed our narghiles—those of us who could derive any other pleasure from a narghile than that of a strong taste of charcoal flavored with painted wood. Presently, the subject of silks was broached and set aside again as unworthy of discussion; after a few more minutes our—host, shall I say?—laid before us a bundle of embroideries, which we examined politely, complimenting him upon his possessions. At length, as if the idea had just struck him, though he knew perfectly well the object of our visit, he pulled a roll of silk from a corner of the shop and laid it before us. We asked tentatively whether he would not permit us to see more, and the business of the afternoon began. The stuffs were certainly charming. There were the usual stripes of silk and cotton, there were muslins woven with tinsel lines, coarse Syrian cottons, and the brocades for which Brusa is famous, mixtures of cotton and silk woven in small patterns something like a Persian pattern, yellow on white, gold on blue, orange on yellow. No doubt we paid more for our purchases than they were worth, but not more than the pleasure of a delightful afternoon spent in the old Turk’s company was worth to us. The bazaars in Constantinople are not so attractive: the crowds jostle you, the shopkeepers, throwing aside oriental dignity, run after you and catch you by the sleeve, offering to show you Manchester cottons and coarse embroidered muslins. A fragrant savor, indeed, of fried meats and garlic hangs about the eating shops, on whose counters appetizing mixtures of meat and rice are displayed, and bowls of a white substance like curds, into which a convenient spoon is sticking for the common use of all hungry passersby, and under the high vaults of the carpet bazaar, solemn merchants sit in state among their woven treasures, their silver, and their jewels. We spent a morning among Persian and Circassian shopmen in Tiflis. There the better part of the bazaar is roofed over, and the shops open onto a street inches deep in dust or in mud, according to the weather, as is the manner of the streets of Tiflis. They were full of lovely silver ornaments, and especially we noted the heavy silver belts which were hanging in every window and around the waist of every Circassian merchant. We fixed upon one which was being thus informally exhibited around a waist, and in spite of the many protestations of its wearer, we succeeded in buying it from him. It had belonged to his father, he said, and I think that it was with some reluctance that he pocketed our gold pieces and saw us carrying off his family heirloom. 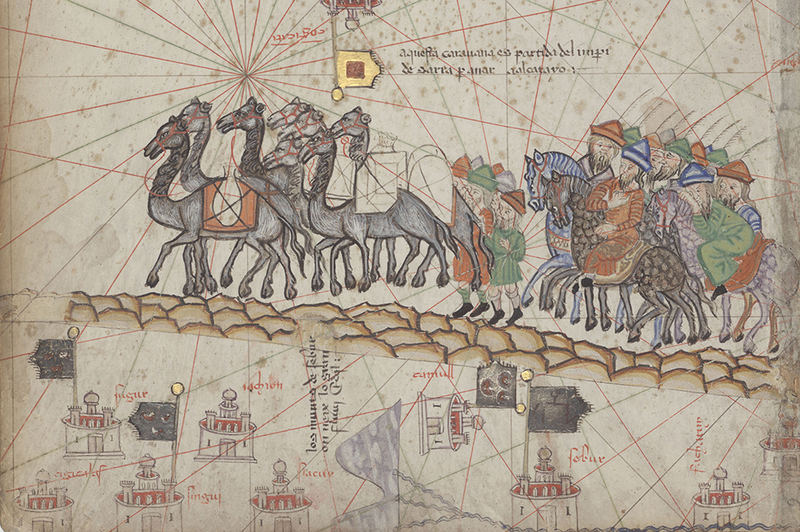 Caravan traveling along the Silk Road, detail from the Catalan Atlas, c. 1375. © Bibliothèque Nationale de France / HIP / Art Resource, NY. In Persia the usual order of shopping is reversed: you buy not when you stand in need but when the merchants choose to come to you. Moreover, the process is very deliberative, and a single bargain may stretch out over months. The counters are the backs of mules, which animals are driven into your garden whenever their owners happen to be passing by. As you sit under the shadow of your plane trees, you become conscious of bowing figures before you leading laden mules by the bridle; you signify to them that they may spread out their goods, and presently your garden paths are covered with crisp Persian silks and pieces of minute stitching, with Turkoman tent hangings, embroideries from Bokhara, and carpets from Yazd and Kerman, and the sunlight flickers down through the plane leaves into the extemporary shop. There is a personal note about these charming materials which lends them an interest other than that which could be claimed by bright colors and soft textures alone. They speak of individual labor and individual taste. Those tiny squares of Persian work have formed part of a woman’s dress—in some andarun, years of a woman’s life were spent stitching the close, intricate pattern in blended colors from corner to corner; those strips of linen on which the design of red flowers and green leaves is not quite completed, come from the fingers of a girl of Bokhara who, when she married, threw aside her embroidery needle and left her fancy work thus unfinished. The bargaining begins; you turn over the stuffs with careless fingers—this one is very dirty, that very coarse; you lift a corner of the carpets, and examining the wrong side with what air of knowledge you can summon to your aid, you mutter that they are only partially silken after all. Finally, you make your offer, which is received with indignant horror on the part of the merchant. He sweeps his wares aside and draws from the folds of his garments a box of turquoises, which he displays to you with many expressions of admiration, and which you return to him with contemptuous politeness: “Mal-e shuma!”—“They are your possession!” He packs up his bundles and retires. In a week or two, he will return with reduced demands; you will raise your offer a toman or two, and after a few months of coming and going and of mutual concessions, the disputed carpet will be handed over to you at perhaps half the price that the owner originally asked; or perhaps the merchant will return in triumph and inform you that he has sold it to someone less grasping than you. From Persian Pictures. At the age of twenty in 1888, Bell graduated from Lady Margaret Hall at Oxford University. The following year she visited Constantinople in the first of her many voyages to the Middle East. In 1915, Bell became the first woman appointed to the British intelligence service; Iraq’s modern borders were largely her creation. In an attempt to stem the flow of the region’s archaeological treasures to Europe, Bell spent the years leading up to her 1926 death establishing the National Museum of Iraq.